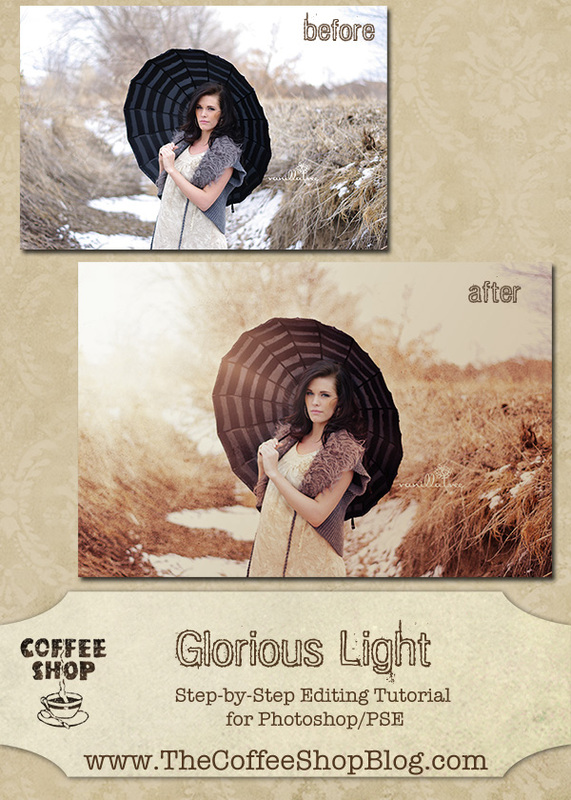 The CoffeeShop Blog: CoffeeShop Glorious Light Photoshop/PSE Action UnWrapped! CoffeeShop Glorious Light Photoshop/PSE Action UnWrapped! Today I wanted to post a tutorial for an edit I call "Glorious Light". 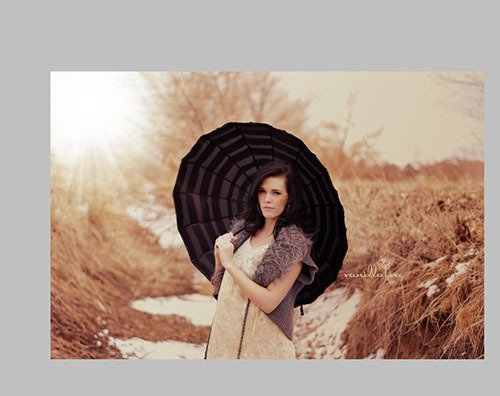 I used a stunning SOOC image from Vanilla Tree Photography in this tutorial. This tutorial is for more advanced PSE/Photoshop users that are comfortable with using layer masks. I will also post an action this week that will do most of the steps for you (I love saving time), but today I wanted to show you the "action unwrapped" so you can see how to do this edit without an action (and can even follow along in GIMP). 1. Open your image. Like most "arty" effects, this edit will not work on every photo; it is best to have an image with great lighting and some open sky for the light. 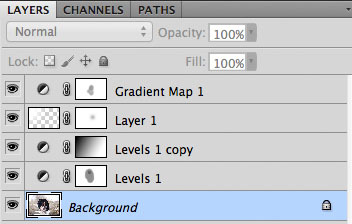 Add a gradient map adjustment layer. Double-click on the left stop and make it red (ec1919). 3. 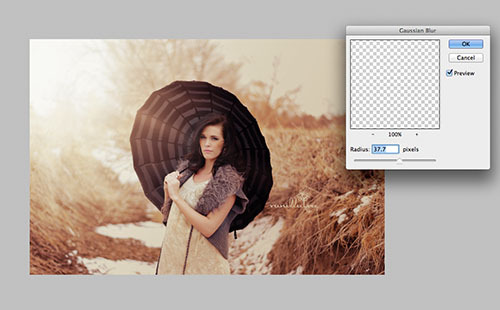 Put this layer in overlay or soft light blending mode and adjust the opacity. Don't be too concerned about the color right now, I always adjust it at the end. I also mask some of the color tint off the skin using the layer mask, but this can be done later. 4. Now we will darken the image. 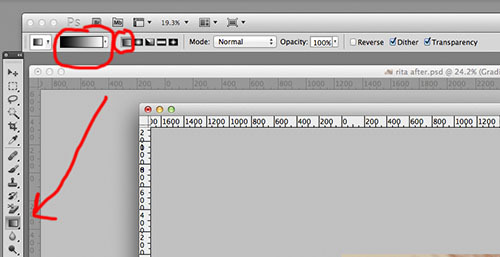 Add a levels adjustment layer and move the right Output Levels slider to the left until it reads somewhere in the range of 184 (bottom red circle). 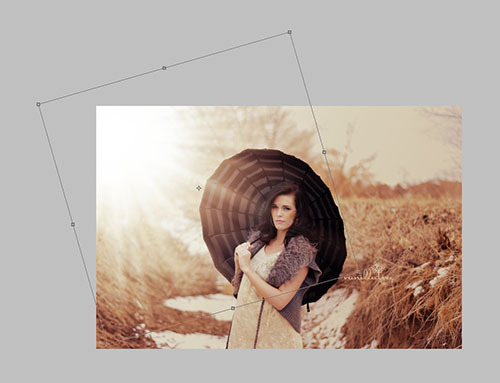 Then move the shadows slider (on the left under the curve) a bit to the right to darken the shadows. Keep this layer in Normal mode. You can adjust the opacity later. 5. 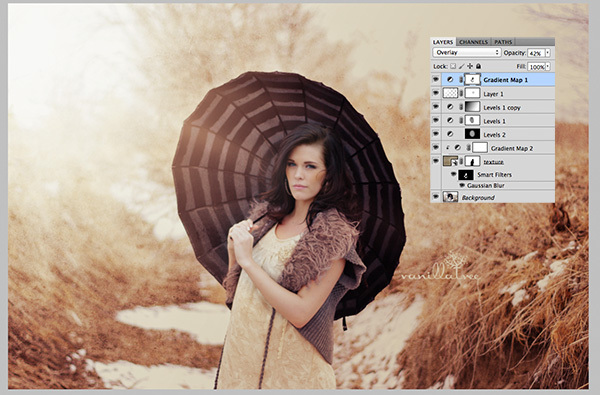 Use a soft black brush in normal mode and low opacity (around 25%) and click on the Levels 1 layer mask and then on the image and paint over her face/arms. Continue to paint over the image until her face starts to look like it is washed in sun. 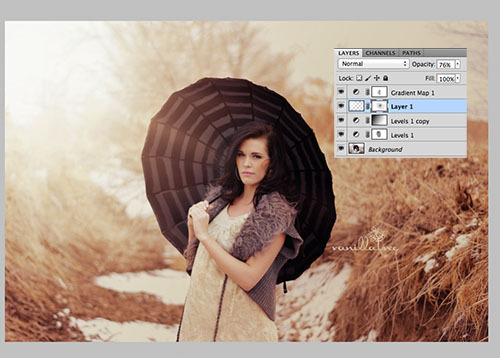 If you add too much "light", simply paint back over the image with a white soft brush. 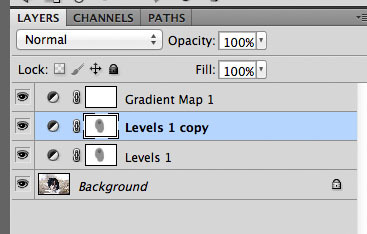 Then make a copy of this layer. 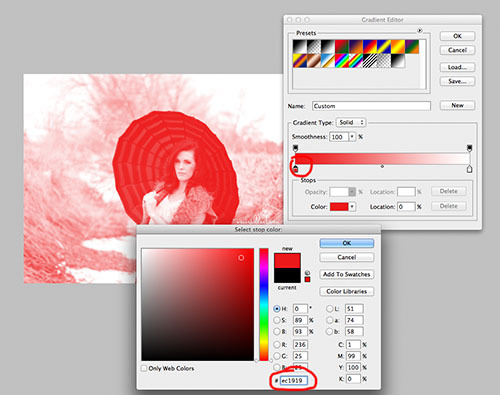 Keep it in Normal blending mode and adjust the opacity later. I add this layer so that I can make a gradient of dark to light (lighter close to the sun, darker at the other end of the image). 6. 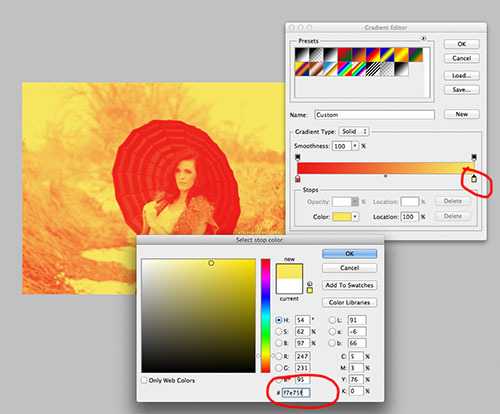 Grab your black to white gradient tool (G) and make sure the setting look like the ones I circled above in the screenshot. 7. 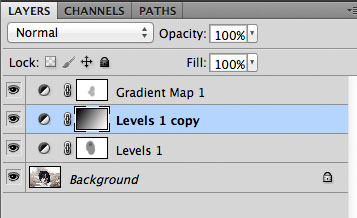 Click on the Levels 1 copy's layer mask to select it, and then drag the gradient tool from the lightest area to the darkest area on your image. This will darken the area across from the light you will add in the next step. 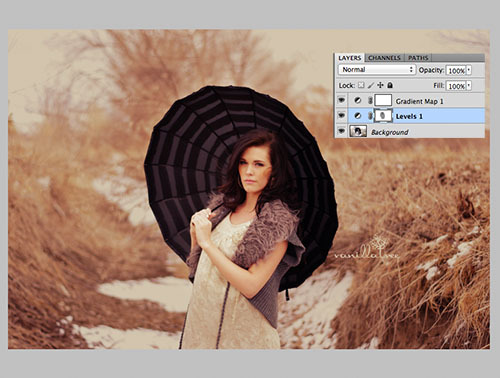 As you can see in the layer mask above, the layer mask has black where I want to mask the darkness. I adjusted the opacity to 57%, but I will go back and play with it at the end of the edit. 8. I jumped back to the Gradient Map layer on top and used a soft black brush to remove a bit more of the golden tones from her face and arms. I erased most of it over her eyes. 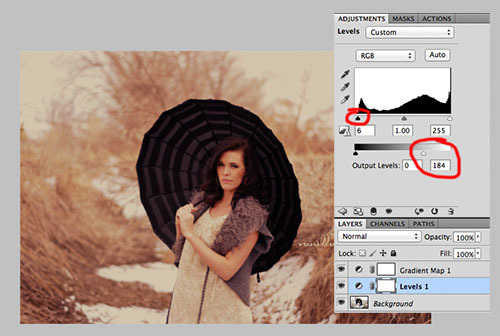 Then I reduced the opacity of the Levels 1 layer to 50%. I will play with all of these layers at the end for my final adjustments. 9. Time to add the sunburst brush! I added a new blank layer just under the golden Gradient Map layer on top (so it will be tinted) and used Brush 1 from my free set of Sunburst Brushes. 10. I added the brush in white on the upper left of this image. 11. Then I free-transformed (Ctrl-T) it to taste. Don't worry about making it bigger, loss of resolution is not a problem with these brushes. 12. I reduced the opacity of the brush layer to 76%. 13. Then I added some gaussian blur to the light layer to make it more subtle. It is really up to you whether you want to see the individual light beams. Sometimes I like them, sometimes I find them distracting. 14. I added a layer mask to the light layer and used a soft black brush at low opacity on the layer mask to slightly remove the beams on her face (but left them on her hair). 15. I want to add a texture. I have an action that I wrote that adds the texture and allows you to "paint" the texture off the skin while keeping the color. I will be releasing that in a few days. 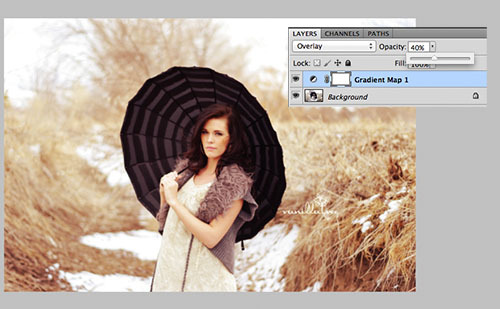 It is an great little action and I use it every time I add textures to my images. 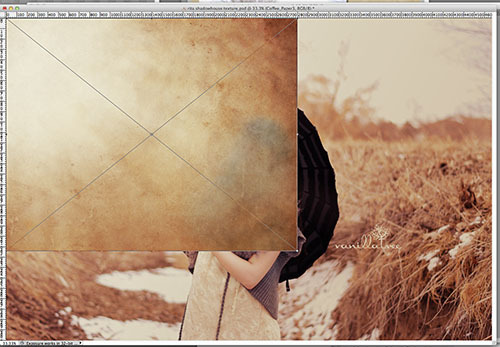 I clicked to select the Background because I want to add the texture just over it. 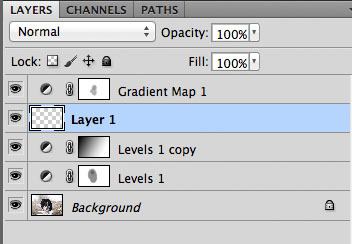 However, you can add the texture anywhere under the top Gradient Map sun layer. 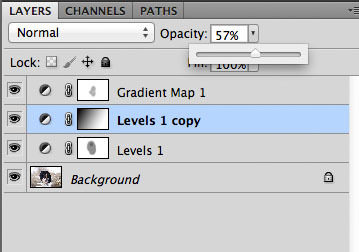 I always make sure it is under the Gradient Map sun layer because I want the texture to have my sun tint. 16. I used the Shadowhouse Creations Coffee 3 texture and desaturated it. 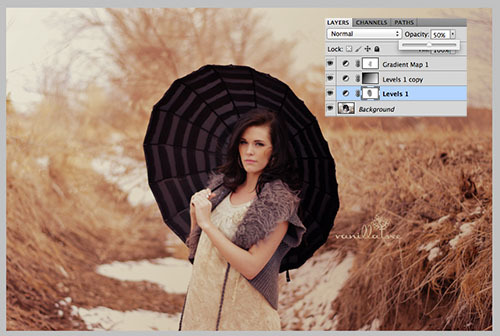 I don't want the texture color to affect my image in this edit. I also removed the texture off her skin using layer masks. When I release my new texture action I will show you exactly what I did here when I added the texture. 17. 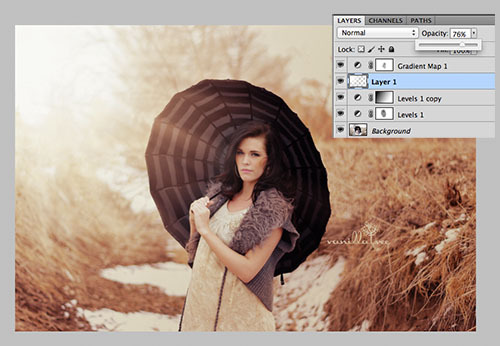 This is my final edit with all of the layers. I added one more Levels adjustment layer under the other two so I could brighten the skin a bit more. I made no adjustments on it and put the layer in screen blending mode to lighten the image, and then added a black layer mask to cover it up. I then selected the layer mask and used a soft white low opacity brush on the face and arms to slightly lighten her skin and also brushed out parts of the image by the sun to make them more "sun kissed". I spent some more time gently brushing off the Gradient Map color tint off the model's skin. Make sure to use a soft black brush that is low opacity. If you remove too much of the color tint her skin will look "off" in the edit. If you take off too much, simply paint over her face with a white brush and start over again. I am really happy how it turned out. Remember, this is not an edit that you simply copy and your image is perfect. You will have to adjust it for every image. I will be releasing an action (here it is!!!) to do everything on this edit (you will have to add the sunburst brush and adjust the layer opacities and masks), and will also be releasing my new texture action. I hope you enjoyed this tutorial! And thanks again to Vanilla Tree Photography for donating her beautiful image for this edit and to Shadowhouse Creations for Jerry's wonderful free textures. Mouse over the image below to see the after/below. Love love LOVE!!! I am waiting with baited breath! I have the perfect photo to use this with! Thank you for sharing your knowledge generously. Thank you so much for posting this! That is an amazing before and after photo. Can't wait to try it. This is seriously so awesome. Thank you for sharing. You are a saint. Love this! Your tutorials are great! This "Glorius Light" is one of my favorites! Thanks for taking the time to do these and give them away!